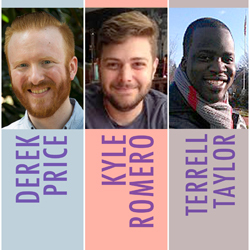 In this episode, we interview the graduate students behind Scholars at Play, a podcast focused on the critical discussion of video games: Derek Price (German), Terrell Taylor (English), and Kyle Romero (History). Stacey Johnson, Assistant Director for Educational Technology at the Vanderbilt Center for Teaching, talks to the Scholars at Play team about the origin of their podcast, how it intersects with their teaching, and how it is shaping their academic careers. Through Scholars at Play, these graduate students are creating their own path for the kinds of interdisciplinary and digital scholarship they want to practice. Derek Bruff: [00:01] Welcome to “Leading Lines,” a podcast from Vanderbilt University. I’m your host, Derek Bruff, the Director of the Vanderbilt Center for Teaching. In this podcast we explore creative, intentional, and effective uses of technology to enhance student learning. Uses that, we hope, point the way to the future of educational technology in college and university settings. [00:22] In this episode we’re going to take that idea of enhancing student learning, and go in a direction we haven’t yet gone on the podcast, which is to actually talk to some students. Shocker. Derek Bruff: [00:33] They have some ideas about how technology might enhance their learning experience. I have with me here Stacey Johnson. She is Assistant Director for Educational Technology here at the Vanderbilt Center for Teaching. [00:43] She has an interview to share with us with three graduate students here at Vanderbilt who are using technology to really open up some doors in their own academic careers, and go in some directions that I think are surprising and interesting. Stacey Johnson: [00:55] Hi, Derek. Derek Bruff: [00:55] Hey, Stacey. Stacey: [00:56] [laughs] I sat down with Derek Price, no relation, [laughs] Kyle Romero, and Terrell Taylor to talk about their podcast, “Scholars at Play.” They launched their podcast as an outgrowth of their interest in video games at a recreational level and also their interest in video games at an academic level. [01:17] They are very aware of how the podcast that they’re working on is preparing them for their possible future faculty role, what the university is and what it’s becoming, and how the medium of podcasts and the work that they’re doing on the podcast is contributing to their future role as educators or as public scholars. [01:37] It’s also just a fun interview. They are fun guys, and I think people are going to enjoy listening to it. Stacey: [01:45] I am here today with Derek Price, Kyle Romero, and Terrell Taylor, graduate students at Vanderbilt University. I am so grateful that you guys took the time to chat with us today. Derek Price: [01:56] Thank you so much for inviting us. Kyle Romero: [01:56] Thank you, happy to be here. Terrell Taylor: [01:59] Thank you. Great. Stacey: [02:01] That’s a good start. Kyle: [02:02] Lots of affirmative, soft noises. Derek Price: [02:04] That’s what you want. Stacey: [02:07] I would love to start out with you guys just giving us a little introduction of yourselves, what you do here at Vanderbilt, and what you think of the other two. Kyle: [02:16] You want to get into it right at the start. Derek Price: [02:21] Which one is your favorite? Kyle: [02:22] You can start, Derek, as our fearless leader. Derek Price: [02:25] I guess that’s me. My name is Derek Price, I am a graduate student in the German Studies Department. I’m also in the Comparative Media Analysis and Practice joint-PhD program, newly in that as of the end of this past spring semester, so, woo. [02:44] My interests have shifted. I did Philosophy in undergrad and that informed my interests going into grad school, but then as I’ve shifted around, I’ve found my way to working on video games. Part of that interest found expression in this podcast that I’ve put together with Kyle and Terrell, which we can talk about more at length, but that started somewhere around November, and now I’m working towards a dissertation on the topic of work and play in German gaming cultures. [03:11] We can talk more about that if you want to, but only if you really want to. Derek Price: [03:17] That’s enough for me. Kyle: [03:17] A recurring a theme I’ve noticed in our podcasts is we say, “We’ll talk about that later,” and then don’t. Derek Price: [03:21] Perpetual deferral. Kyle: [03:23] It’s a good start, yeah. Derek Price: [03:24] It creates the tension. Terrell: [03:25] The endless deferral [indecipherable]. Kyle: [03:29] We must talk about that thing later. Stacey: [03:34] Kyle, I think it’s your turn. Kyle: [03:34] OK, great. I’m Kyle Romero. I just finished my third year. I’m a PhD candidate in the History Department. I’m a little different from Terrell and Derek in that my dissertation is not on video games or gaming. I came at the digital humanities and video games and game-analysis sort of late in my academic career, or relatively late. I’d already decided on my dissertation. Stacey: [04:07] That is such a timely topic. Kyle: [04:09] It’s one of those really horrible things where it’s way too timely and it’s way too accurate. Yeah, I wish it wasn’t as timely as it was, but…that’s that. Derek Price: [04:34] Associated, Collaboratory. Stacey: [04:37] Some of my favorite digital humanists have come out of HASTAC. Kyle: [04:40] Yeah, it’s a great program. [04:41] For those digital-humanities projects, I’ve focused on video games, and particularly historically inspired video games and how historically inspired or historically situated video games have used history to make their games and also how they reinforce or break down certain ways of thinking about history. [05:02] I really like Terrell and Derek. They’re great. They’re really great people. Derek Price: [05:06] I didn’t do that. That was [indecipherable]. Kyle: [05:08] Yes. We get it, Derek. Derek Price: [05:09] How do I feel about both of them? Silence. Kyle: [05:13] Speaks volumes. Speaks volumes. Terrell: [05:17] I’m Terrell. I’m going into my third year in the English PhD program here at Vanderbilt. [05:24] My academic interests are primarily in African-American literature within the 20th century as well as the Caribbean — thinking about the ways that Caribbean literature and culture and African-American culture circulated around ideas of cultural energy, vitality and the ways that different ideas of what it is to live a life and to inhabit a life world articulated by various non-fiction writers and fiction writers and poets in both of those canons. [05:52] My interest in gaming is something I’m still really trying to develop and trying to think about how I can work with that. Particularly the ways that gaming can be a very energizing experience, vitalizing experience and the way that gaming gives you the capacity to experience a different form of embodiment where they can play with embodiment and play with mechanical difference to suggest the difference about a player avatar or a particular character, so on and so forth. [06:16] Here at Vanderbilt, I’ve been getting involved with the podcast, looking into opportunities with HASTAC and various other things, ViTAL, so on and so forth. Here at the Curb Center, we’re in the process of putting together a video game archive. This summer, I’ve actually been working to pick out the games that both I like and are also very important and critical to belong in an archive — delineating those two can be quite difficult. Terrell: [06:37] I’m thinking about ways to have something to complement those academic interests that can be something of a digital project that can supplement or stand aside from the dissertation in interesting ways. Stacey: [06:49] Not having a deep knowledge of game culture, I’m wondering what kinds of video games would go in an archive. Can you give us a few examples of what games would fall into that category? Terrell: [07:01] Sure. So the big questions that I think we’re tackling right now are…It depends on what it is that you want to focus on. [07:08] For example, I think a few years ago, I want to say this might have been 2008 or 2009, the Library of Congress actually had a small archive of games that were particularly important. This was in the moment where we’re in sort of the generation of the Xbox 360, the PS3, the Wii. All of these games were…most of them I think were Atari, and there may have been a few that were NES. [07:27] Thinking about the games that came out and established, this is what it means to play a game. For example, the original Super Mario Brothers — really important because in so many ways it sets up a genre of the platform or a genre of what it means to start playing a game. It establishes the idea of what lives are. That’s a really important thing to get that in there. [07:46] Then there are various other moments that a genre sort of foments. For example, around the mid-1990s, there’s this thing called Metroidvania, so picking out the games that begin that genre. [07:57] Separately, because we are in an academic institution and this is something that I think is important just for video game studies, but also for academic and cultural interest at large, I’m trying to think about ways that we can build this archive so that various centers and places or nodes on campus could find it useful. [08:11] For example, I’ve been in conversations with a few people who are involved with the Women and Gender Studies Department here and trying to pick out games that I think do something interesting with the question of gender. There are handful of games I think really touch on that. [08:22] Those are a couple of things I’m starting to get my hands on to and think about this archive. Stacey: [08:28] Really cool, thanks. So how did you guys come about starting your podcast? How did that happen? Derek Price: [08:32] You all can’t hear that, but Kyle just sort of gestures towards me. Kyle: [08:37] I make a lot of visual jokes. Kyle: [08:38] Yeah, because it’s very good for the podcasting format, the visual jokes. Derek Price: [08:43] The visual’s important to the podcast. [08:45] Actually, I failed to mention this in my bio, but I’m also a HASTAC scholar for last year, doing my third year. This podcast was really…For HASTAC, for those of you who aren’t familiar with that grant, you are encouraged to do a project for the year that involves the humanities, the arts, the sciences in some way. [09:05] I was here at the Curb Center for Art, Enterprise, and Public Policy, and I was trying to think about what kind of project I wanted to do. I’d been listening to game podcasts a lot and there was one person in particular, a guy named Austin Walker, who had been in a PhD program and had moved into the games journalism space. [09:27] I’d been listening to this podcast for a while and then he joined it and he brought this academic rigor to that space, which was in no way an explicitly academic kind of podcast but he posed really interesting questions that sounded like the kinds of questions that I liked to discuss in seminars and that kind of stuff. [09:46] I was sort of inspired by that and just also, since I had this opportunity to create something, I thought, “You know what? I want to try and do almost like a mini seminar on games,” and I wanted to do that as my HASTAC project. [10:00] [laughs] I’d put up little posters with like a Creative Commons licensed picture on it of a controller, which is still the logo for out podcast right now, in the graduate student carrels because I wanted to find some other graduate students who were also interested in games. [10:18] I didn’t want to do this as a solo thing where I come up with a story or something like that and talk it through. As a person, I like to have conversations, it’s where I’m most comfortable. So that was it. [10:50] I was like, “That is exactly what we had wanted.” What Derek had imagined and what I completely agreed with — we were trying to model a graduate seminar because in a graduate seminar there are jokes sometimes. It could be fun, but the academic rigor is there. Getting all those aspects together was what made it for me. [11:34] We use those to ground the discussion and to give us a shared, common theoretical, critical vocabulary that we’ve all read it and we may or may not agree with it, but we can at least meet each other using those terms. I think that’s been really successful in keeping the conversations…Although the episodes tend to be about an hour long, they’re pretty focused around a certain theme or topic. Kyle: [11:59] The ideal would be that [laughs] the repeat listeners would also read the texts. I am not sure if that’s ever happened, but maybe. It’s very possible. Derek Price: [12:09] Terrell, do you have any thoughts to add about the inception? Terrell: [12:13] It’s just been great. The way it spilled out into a number of the things. [12:17] For example, I think that that same time we were getting things together with the podcast, there was the [indecipherable] camp. I think we think we both did…You did one on podcasting, I lead a session on thinking about video games critically. We’ve been doing things with Vandy Lan, so on and so forth. Derek Price: [12:33] Yeah, student club on campus for games. Terrell: [12:35] I think even some professors have reached out to us about coming in and doing some things [indecipherable]. Derek Price: [12:40] Part of the reason we were involved in the whole video game archive — that’s a vital working group, the Institute for Digital Learning — working group was that it was known among the digital humanities people…They’re like, “Oh, those are our video game people.” Those are the people interested in those things. We’ve had the opportunities to spread out and do the other things on campus. [13:00] Sorry, one last note. [13:18] But building a community of people on campus who are interested in games because I knew that there were people…For example, my colleague Curtis Maughan in the German Department also gave me an idea that it was possible to do a games dissertation in the German Studies Department. I knew he was interested in it. He was also in Germany for the last year and a half. [13:43] I was hoping to find a way to bring a group of people interested in this topic together because there’s no home for a game studies at many universities. Sometimes, it lives in the communication’s department. Sometimes, it lives in media studies departments when those are there. Sometimes, it’s in English departments. I think it’s rarely in foreign language departments, like German for me. [14:07] I’m really happy with how this podcast has built a momentum that I’m really happy happened. Kyle: [14:16] I will say I think just building off that, one of the really productive things of our podcast is our different backgrounds, our departmental backgrounds because it had never really been as apparent to me how differently we all approach things in different departments. [14: 30] I was a little worried coming to the podcast. History has a reputation as being anti-theory, like we’re just people who hang out in archives — I mean I do. Kyle: [14:40] It just made me think about the way that, “No, there actually are theories in my field. It makes me think about things a little differently. We can bring those together in productive and sometimes contrary ways.” I think that’s been really cool. Derek Price: [15:13] Which is what you get in a grad seminar, right? Derek Price: [15:15] That’s the goal. Stacey: [15:16] That’s great. So to explore a little bit more, like the actual nuts and bolts of how you put together the podcast, Derek, I heard you mention in a meeting a couple months ago that you approach planning a podcast in a similar way to the way you approach planning a lesson for the classroom. [15:34] That set my mind racing about what are the intersections between what you do in the classroom and what you do here, maybe how do you put the podcast together in a way where it might be useful for people who are students of gaming. Do you want to speak to that a little bit? Derek Price: [15:48] Yeah, of course. I’m sure the other guys have thoughts about this as well. I know they do. Stacey: [15:52] I just happened to overhear you say that. Kyle: [15:52] That’s fair. Derek’s the smartest of us. It’s totally good to start with him. Stacey: [15:58] I mentioned you, but everyone is welcome. Derek Price: [15:54] This is just super not true. Terrell: [15:57] You are our fearless leader. Derek Price: [16:03] Basically, making yourself legible to audiences, who may not have a shared context. I know that we have listeners that aren’t in graduate school. So, important to us…We have show notes, basically, that we use. This a common thing for podcasts. We attempt to order that in a way that slowly introduces each object that we’re going to discuss. [16:26] Important for me is this triangulation. I always want to have generally one game or a series of games that are very close to each other, one academic text, and maybe a third academic text or that other, more accessible text or video. We go sequentially one by one. First, we start with a game. If it feels relevant, sometimes we start with…In fact, often, we start it with texts instead. [16:53] What we started doing around episode three was divvying up each object to one of us. We give a quick five-minute summary of that thing, highlighting the terms or the arguments that are most helpful or interesting to the topic at hand. [17:08] After we’ve established some sort of summary, that’s when we launch into a discussion of, “What was our experiences with this text or this game? What stood out to us?” Then we start engaging with each other in that argument. [17:23] It’s a simple structure. It’s not super complicated or novel, I don’t think, but depending on the things we’re talking about, it makes more sense to start with one or the other thing. I don’t know. Do you feel like I hit most of the structural things for how we organize it? [18:00] That balance between “we have some confines, but we also have something that’s expansive,” is the dynamic that’s critical to a podcast or a lesson. Kyle: [18:09] I think of it similarly, too, to how I would plan for classes, for graduate seminars. I would play the game, take notes, read the text, take notes, and have that exist and sit on it for a day. [18:52] For one of our episodes we talk about the game Sid Meier’s Civilization. I say, “It’s really important that we talk about the technology tree at some point.” I would wait for a moment where it came up and be, “OK, good. I have all these notes on this thing and we’ll talk about it.” Prepping moments as well as…in that structure that Derek laid out. Derek Price: [19:13] I think there’s an interesting duality at work, because we’re not just sitting around a table having a working group. We’re actually recording a podcast. To be honest, when I thought of lesson planning, the way that I think about it is more — I mean it’s both — but it’s more how do I make sure that the three or four of us continue to have a good discussion? [19:34] In that way I’m prepping more for a conversation with equals, who all have equal access to the same texts that I’ve read. That’s always first and foremost in my mind. We put the show notes together. I started making the structure, but we’ve ended up working in that all together. But also at the same time, there’s that obvious part which is that we’re making this for other people to listen to. [20:02] In thinking about that, you mentioned before we started recording of thinking of things as a model, or as a thing to be assigned to listen to and maybe to get a sense of and then to later discuss. Whether or not they are important conveyors of information, or if these podcasts are meant so that you come away knowing more about game studies or about that game, I’m not so sure about that. [20:28] I would be more sure of the fact that what we’re doing is modeling discussion, basically, and how a seminar can function. That’s something that’s been on my mind a lot for thinking about how to plan these things. There’s two different kinds of lesson planning happening essentially. Terrell: [20:49] I don’t know if either of you would agree with this, but I feel like as much as I learn in the prep for the podcast, I learn just as much if not more in our exchanges and the steering of the conversation. In terms of self-directed learning, the podcast models that in ways. Stacey: [21:05] I’m wondering if what you’re doing in the podcast is having any effect on what you’re doing in the classroom, or if there are any intersections there? Kyle: [21:11] I desperately try to hide that I’m on a video game podcast so my students would respect me. Derek Price: [21:20] Right now we’re producing…this is an active…the language of activity is tricky. For the three of us it’s active in a way that it might not be for a listener. They’re probably not reading the texts because we’re not advertising what we’re doing before we play the episode. You can’t even know what you’re supposed to read before you listen or before you download it and look at the show notes. Derek Price: [21:44] Right, exactly, right. To look at it, stop listening, go get the texts, read them, play the games, and then come back, because they really, really want that good, good content. Derek Price: [21:57] It’s an active process for us. It’s probably more of a, let’s be real, borderline entertainment for people who are listening. It’s both modeling interesting conversation, but also kind of entertainment. I think it’s good to be upfront about that. [22:11] One thing that it could be for the future is, because we’re all learning how to make a podcast and how to organize it…the technology doesn’t have to be everyone has their own mic, they have a pop screen, you have Logic Pro open, and you’re doing all of this in a special booth. [22:26] You can have a lot lower tech version. 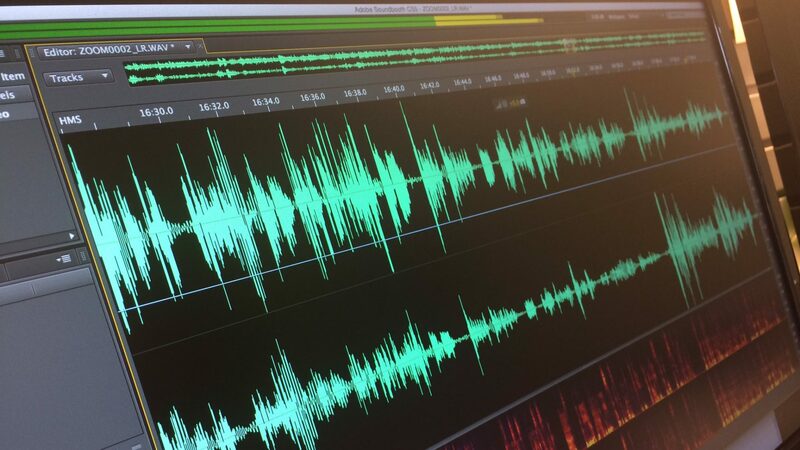 By making this podcast a bunch, we’ll be able to get our students to make podcasts and introduce them to that as a method of working through things. [22:40] It just raises the stakes for our conversation and really forces you to know your stuff and be ready to talk about something. Also, because it sounds fun, instead of go ahead and have a conversation in front of the class, go home, record this thing, plan it out, tell me what you want to accomplish with it. I see it as practicing for showing other people how to produce their own podcast. Stacey: [23:06] I’m going to try and recap that a little bit. Stacey: [23:11] So what I heard you say was that it’s not necessarily affecting your teaching right now just because of the level you’re teaching. Derek Price: [23:17] I think so, yeah. Derek Price: [23:20] Not quite, yeah. Stacey: [23:21] However, in your future faculty career…Are you planning on being faculty? Derek Price: [23:27] It’s always a dream. It’s always a hope. Derek Price: [23:31] I don’t know if you saw that really sad article about “be a manager for $28,000 a year of 10 graduate students, and teach 3 classes, and also 67 percent health care.” I don’t know if you all saw that, but yes. I like the kind of work that happens in academia. If I could get a job in it, I think it would be fantastic. Stacey: [23:49] Some people it’s not even their goal [indecipherable], so I was just checking in [indecipherable]. Derek Price: [23:53] Yeah, sure. Stacey: [23:54] In a potential future faculty role that you would harness these skills to really be able to give students an insider view on how to make a podcast and teach them how to craft an argument, craft a story, produce something that might have a larger, more authentic audience than what we normally do in classes through podcasting. Or if you end up teaching comparative media, you might actually be able to assign these podcasts as models of what class discussions should be like. Is that…? Derek Price: [24:25] That’s much better and quickly said than what I said. That’s fantastic. That’s great. Stacey: [24:29] Maybe this should just be me, recording what I think you meant to say. Kyle: [24:40] You can just hear your voice in the background, [makes talking noises]. Here’s what he’s saying. Derek Price: [24:44] That sort of imply-all version. I love that. Stacey: [24:47] I have always wanted to do that kind of podcast. Today might be the day. Terrell, do you have any other insights on the intersection between what you do in the classroom and what you’ve been doing in the podcast? Terrell: [24:58] Yeah. I think the big thing that I’ve most consciously thought about is the fact that the courses I’m teaching now are supposed to teach students writing. The place I’m at thinking about that is that teaching writing effectively is about teaching them different types of intellectual/expressive moves. [25:19] Moves are things that happen within a podcast. For example, when two people are going back and forth, and a third intervenes in a particular way, that’s a kind of intervention or type of action happening in that expressive space. We understand and we have a feel for that. [25:38] Especially if we listen to certain podcasts over and over again, certain voices or certain personalities start to come out and they become known for doing certain things in a certain way. Not in a reductive sense, but we tend to gravitate towards certain character affects of a personality as they come to form in a podcast. [25:54] That’s something that, at once Derek was saying, demonstrates good discussion skills and what it means to have a good conversation. What I want to look for in a good class participation or a good class discussion, students can learn that from a podcast. I don’t know if I want to necessarily get to the point where they’re close reading the podcasts. Derek Price: [26:16] God no, please. Terrell: [26:17] I think it’s important. I can definitely say that video games actually did this for me in a particular way — a particular video game show that I used to watch growing up, with Adam Sessler, who’s no longer in video game studies, or media, or criticism. [26:32] But a lot of the ways that he would talk about games influenced the way that I began to write. Something about that persona, the way that he would approach them, the way he would carry himself, the fact that it was fun, the fact that it was exciting. [26:44] Whether it was talking about whatever PlayStation 2 game was out, there was something about that that I could then take into writing about Shakespeare or writing about the Battle of Agincourt. If I could somehow get that connection going, that is the thing that I’m sitting right now. Derek Price: [26:59] There’s something really valuable to be said about the funness, accessibility of video games. That’s something that, again if I become a faculty — maybe one day, that’s the dream [laughs] — I’m really deeply interested in public history, getting into the community, and accessing more people than just inside the classroom. [27:18] Especially in 10-15 years, everyone’s going to be playing video games. Everyone already does now, even if it’s an app on your phone or something on Facebook. Everyone games in some way or another now. It’s going to be omnipresent. [27:30] Is there a better way to access beyond the classroom into the public more than saying, “Let’s think critically about these things. Let’s try to inculcate ways of thinking, ways of knowing, ways of talking to each other even about something that’s really fun, and interesting, and intuitively we understand”? [27:47] Grow those networks outside of the college, something I want to do, and games are a great way to do it. Stacey: [27:54] That’s great. What are your highest hopes for the podcast? Derek Price: [28:00] Oh man! I don’t want to be too dramatic, but the University is changing. There are structural things happening outside the University that are affecting it — political, economic things. There are…I think the University can’t afford to be a closed space anymore. It’s not anymore. It can’t afford to think of itself in that way anymore. [28:24] I think that public-oriented, or at least work that’s done that could be accessible to the public, like a podcast, is not only a nice thing to do and play around with, but actually essential to the future of whatever the University becomes. Stacey: [28:42] Anyone else? Do you have high hopes for the podcast? Kyle: [28:44] I’m pretty similar to Derek. I think that’d be great. I’m going to get a little too Aaron Sorkin-ey here, but there’s something to be said for increasing the quality of conversation in the United States, in the world. I don’t know…Is a podcast about video games going to solve everything? Stacey: [29:04] Gaming journalism has suffered from some bad press. I think quality conversation is well needed. Derek Price: [29:12] I think just inculcating modes of conversation that are based on mutual respect, based on production of knowledge, not based on fear and anger. Derek Price: [29:22] That would be great. Derek Price: [29:24] Something kind of great about our podcast that’s already happened is, according to SoundCloud, we have a listener in Kuwait. We have listeners in Eastern Europe, in Mongolia. Kyle: [29:36] Yes, it is the Mongolian cohort. Stacey: [29:41] They get together every Sunday to listen to your podcast. Kyle: [29:43] Every four months. Derek Price: [29:44] Yeah, every four months. Kyle’s riding me on this. He’s rough, man. Stacey: [29:49] He would like a faster production schedule, please. Terrell: [29:52] Because he’s not a graduate student like the rest of us. [30:06] It’s mind-blowing to me that something that we do in Nashville, Tennessee, in this little room in the Curb Center, can have an effect on someone across the world. Magnifying that would be my dream for the podcast, and my life generally. Kyle: [30:38] Scholars at Play. Derek Price: [30:40] It’s our podcast. Kyle: [30:42] It’s the one we do, Team SAP. [31:00] It has been the base of operations for a number of very productive things since we’ve reached out on campus to do a bunch of connections as we really start thinking about games in a kind of intellectual and rigorous way that’s still very accessible. That is part of what brought me to grad school and to academia. [31:18] I think that developing that in our own terms, in our ways…Derek, you just produced a video essay on a video game. The number of video essays that I watched prior to meeting any of you or, again, being here at Vanderbilt, the fact that you have one is really inspiring to me. I hope that maybe we can move forward with that. [31:38] We have a bunch of ideas that we want to do here and now. I hope that we each are able to do that together but also have our own various projects and investments. We all want do some form of blogging and have video games be part of that. [31:52] Eventually, sadly, we may have to, upon leaving Vanderbilt, go our separate ways. Just to know that it all began here. If it lands, great, but if it doesn’t land, it’s still part of the craft and I think what drives us in our own respective ways. Derek Price: [32:07] I love you too, Terrell. Kyle: [32:09] Yeah, lots of love. Derek Price: [32:16] Do our answers ever go anywhere? Stacey: [32:20] One last idea. I was thinking about at the Center for Teaching, we talk a lot about students as producers. In grad school, there’s sort of a production track where you produce small papers and then you produce a dissertation. There’s often just not room in that time to produce other kinds of things. [32:40] You guys are already producing a podcast, you’re producing video content, you’re talking about blogging, you’re producing and making connections really outside of the traditional grad student role. I wonder if you have any insight into what the formula might be. Why you have been able to be successful producing really rigorous, interesting academic content in different modalities, besides the traditional grad student role. Terrell: [33:33] Every four months. Derek Price: [33:34] Every four months, four to eight months. Wow. Okay. I think we’ve existed for 9 or 10 [indecipherable]. [33:46] It’s great that being able to do this is both fun and productive for me as well as I think increasingly becoming a necessity in the market for academia. Kyle: [33:54] It’s a good answer. Derek Price: [33:56] I know. [33:57] Part of what makes it possible, I know for sure, is that when I was a very young teenager I was in bands and we tried to record demos. Derek Price: [34:06] Yeah. They were super good. Let me know if you want a copy. I could actually [indecipherable] put it on Bandcamp. Kyle: [34:16] That’d be great. I would also love to hear that. Terrell: [34:19] Oh my God! Oh my God! Derek Price: [34:21] I have a familiarity and an ease or just a confidence with technology and that kind of stuff that was like, “I’ll figure it out. I’ll just get the tools. They’ll all be there.” Then the Curb Center has this studio that we’re sitting in right now. That also enabled it — I mean I got the HASTAC grant that enabled it. There’s a whole bunch of things that I was lucky enough to get. [34:55] One of the problems that I see with technology the way it’s usually used in education is students are expected to do things really quickly with no in-class training. Put on a podcast, we’re not going to learn how to do it in class, but here’s a PDF tutorial you can follow. But you had years of training in different kinds of audio production before you actually started podcasting, so you could just jump in. Stacey: [35:16] Then the third, the Curb Center actually provided you with the really professional quality resources you needed to do a good job. Terrell: [35:24] I think two things which you just said really captured what I was thinking towards this question. [35:28] When it comes to academia, a thing that we are — I don’t even want to say we’re necessarily discouraged from admitting it as graduate students or even people who are interested in academia — is that part of what brought us here at some point in time was the kind of dream, Luke Skywalker watching the rebel alliance move around and we want to do that. [35:50] We saw something on TV that grabbed us. Maybe it was a teacher, maybe it was a scholar in a particular forum. Maybe it was a speaker, and something about that’s really enchanted us. That’s what moves us forward, that kind of light in the eyes. Then once you get in and start to realize the drudgery of the dissertation, some other things could be a little bit a bit heavy, that gets toned down and managed. [36:11] But I think, to a certain degree, in part, and maybe this is true for all of us, yeah, we listen to podcasts and we think, “Wow, that would be something really cool to do. I would love to have an opportunity to sit and engage with some people in the way that…and listening to that.” That attraction, that passion that you were just talking about is an important element to the recipe. [36:31] I also think of a question of training. It’s funny…Derek, you mentioned that you had your band and you did some recording. At the time, would you have called that training? Derek Price: [36:44] I definitely wouldn’t have. Terrell: [36:46] To the same degree, can I really call myself getting home and watching X-Play on TechTV a real training to write essays or to think about games criticism? Maybe not. There’s ways of training, there’s ways of exposure, there’s modes of social engagement of culture that in fact develop skills or develops levels of familiarity, levels of competency. [37:08] That’s what I think [indecipherable] is trying to meet pedagogy in interesting ways now. We all interact with tablets and touch screens. There are certain competencies by virtue of how we’ve become fluent with various…most obviously example coming to mind it’s something like AIM or chat…in a way that there’s certain shorthands. [37:25] That’s a technology, that’s a fluency, that’s a currency that certain generations have. How do you tap into that and say, “What can you do with that to meet something real?” I think that’s an important part of the recipe that doesn’t necessarily require you have years of formal training, but have you been trained without knowing it as training? It’s important I think. Derek Price: [37:45] It’s almost like enjoyment, pleasure, play and work are merging together there. Kyle: [37:53] Also my dissertation topic. Stacey: [37:54] I had a really fun conversation with you guys. Thank you so much. Derek Price: [38:02] Good. This was fun. Kyle: [38:04] Great. This is wonderful. Terrell: [38:05] Thank you. It’s been great. Derek Bruff: [38:08] As Kyle mentioned, it’s time for the outro. That was a really fun interview. Stacey, having listened to a few episodes of Scholars at Play, I was surprised to find out that they had actually not known each other before the podcast. They’ve really great rapport, the three of them. Stacey: [38:23] I have to say, stepping into their studio with them as the fourth, I really felt like the four us had a great rapport and we should start our own podcast about something related to podcasts. Derek Bruff: [38:35] That’s very meta. I should add, you’ve shared with me you actually sat down with him for more than hour and edited lots of fun stuff out. Stacey: [38:44] We try to keep the content of this podcast mostly about higher education, teaching and learning. The 10-minute stretch about the importance of Super Mario, we left that out even though I felt like I made some really important intellectual contributions [laughs] there. Derek Bruff: [39:02] We’ll put a link to the Scholars at Play podcast in our show notes. Certainly, if our listeners would like more video game theory, it’s the place to go. [39:11] I was also struck by just how intentional these three young scholars are in exploring this new space in academia. I think it’s new in a couple of ways. One they are in the area of video game studies, which doesn’t have a traditional academic home as was mentioned in the interview. It’s in this interdisciplinary liminal space as an academic area of study. They’re having to chart their own course there. [39:37] They’re also using this new technology of podcasts to create a venue or a forum where they can actually do the kinds of work that they want to do as scholars. That’s just really impressive, and I think it gives us a little insight into how grad students might be thinking about their own education and their own careers and creating venues for the kind of work that they want to do. Stacey: [39:59] I think that’s an excellent point. One thing that I have mentioned before is that these three are very aware of the state of the academic job market. They have a lot of insight also just into the state of the university — what research and scholarship looks like right now in the modern university and what it might look like when/if they are ever in faculty careers. [40:20] For graduate student there is a traditional path of writing and publishing, writing a dissertation and then publishing that. They have begun publishing right now using new media in a way that is really accessible, as they mentioned, even to people in Mongolia. Derek Bruff: [40:39] Right. It’s something that I have observed, especially in the broader digital humanities area, is that as humanity scholars are looking at digital media as they’re finding new forms of scholarship, our grad students are often having to really struggle to find a way to blend that with more traditional forms of scholarship. [41:02] I’ve talked to grad students who will write a traditional dissertation, but they’ll have that one chapter where they have this really cool GIS project in the middle of it. It’s interesting to see perhaps a slightly more integrated approach, thinking about not just one chapter in the dissertation but the work that they’re doing here at the Vanderbilt and using these new tools to explore spaces that they’re really interested in. [41:26] You had mentioned that it’s actually put them on the map here at the Vanderbilt. Stacey: [41:30] Yes, so that’s another thing. The three of them in their individual departments, English, History, and German studies, all had this interest that they were developing. It wasn’t until they came together and started building this podcast together that they were recognized locally on campus as experts in this area. [41:49] It’s given them a lot of opportunities on campus and in other groups related to their campus experience to be invited to be a presenter or speaker or to contribute some expertise in games studies. Derek Bruff: [42:04] It gets me thinking about the ways that we, as faculty and instructors, might be able to help and support this type of activity. You noted in the interview the kinds of resources and mentoring and support that these three have received. They brought a lot to the table themselves, certainly, but there were some resources here at Vanderbilt that helped move them along a little bit. [42:29] Even if our students are exploring academic areas or technologies that we’re not that familiar with, there may be ways for us as instructors to still at least allow them and encourage them to do that exploration. I know a lot of grad students run up against just roadblocks, trying to do anything that’s away from the tradition. [42:46] One thing I’d like to say, and I’m sure you’ve heard me say that several times, is it’s possible to have a really tightly controlled project that you engage students in and get really consistent results. However, if you open that up and don’t give students as many constraints and don’t control as tightly, you are opening them up both to succeed beyond your wildest expectations and to fail in ways that are going to provide the learning experiences that your tightly controlled project cannot. Stacey: [43:16] Whenever I have a choice of controlling my students’ output more or controlling my students’ output less, I try and err towards less and really open it up and see what they can do. [43:27] I think what these graduate students were given is a testament to that. An open-ended grant to do something interesting in the digital humanities, a fully functional stocked space to create what they needed to create, and just a lot of faith and trust from the people who are mentoring them that they could bring their talents to bear in an interesting way. Derek Bruff: [43:47] Thanks for the interview, Stacey. Stacey: [43:49] No, my pleasure. Derek Bruff: [43:49] It was a lot of fun. In the future episode we’ll have another interview with a Vanderbilt colleague on video games and teaching. Jay Clayton, a Professor of English, brings video games more intentionally into his own classroom space. We’ll get to continue talking about some of these topics. [44:05] In the meantime, if you’d like to hear Scholars at Play, you can find a link to the podcast in our shows notes. [44:11] You can find those show notes as well as past and future episodes of Leading Lines on our newly renovated website, leadinglinespod.com. We now have a nice tag cloud on there, so you can easily find episodes by topic. Our search functionality covers all of our transcripts. Almost all our episodes have full transcripts, and those are searchable as well. [44:29] You can also follow us on Twitter @leadinglinespod, and you can send us a voice memo with your thoughts on this episode to leadinglinespod@vanderbilt.edu. I stole that idea from Stacey and her podcast. Derek Bruff: [44:41] Leading Lines is produced by the Center for Teaching, the Vanderbilt Institute for Digital Learning, the Office of Scholarly Communications at the Vanderbilt library, and the Associate Provost for Digital Learning John Sloop. This episode was edited by Stacey and produced by Rhett McDaniel. [44:55] Look for new episodes the first and third Monday of each month. I’m your host, Derek Bruff. Thank for listening.